I landed at Dibrugarh and food was the first thing on my mind. It was 2.00 pm, I was in no mood to travel ahead without food. 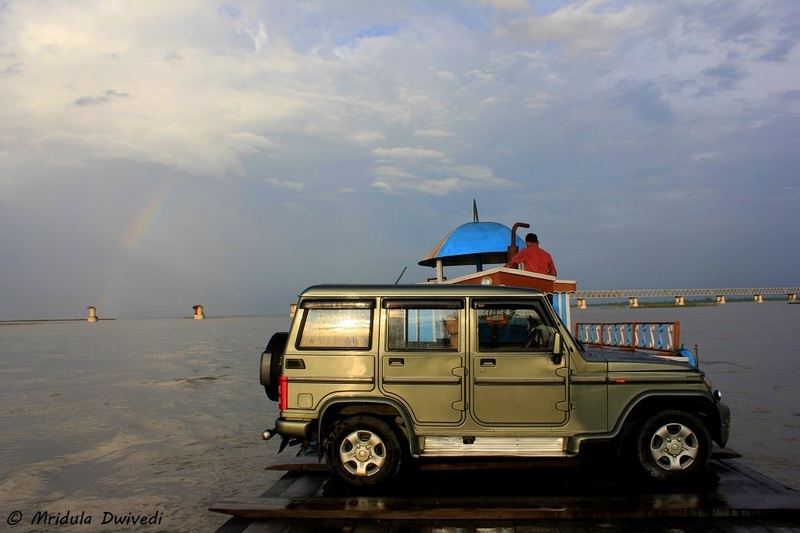 I would board a ferry along with the car and cross over the Brahmaputra River at Bogibeel. I was eventually going to Pasighat in Arunachal Pradesh. 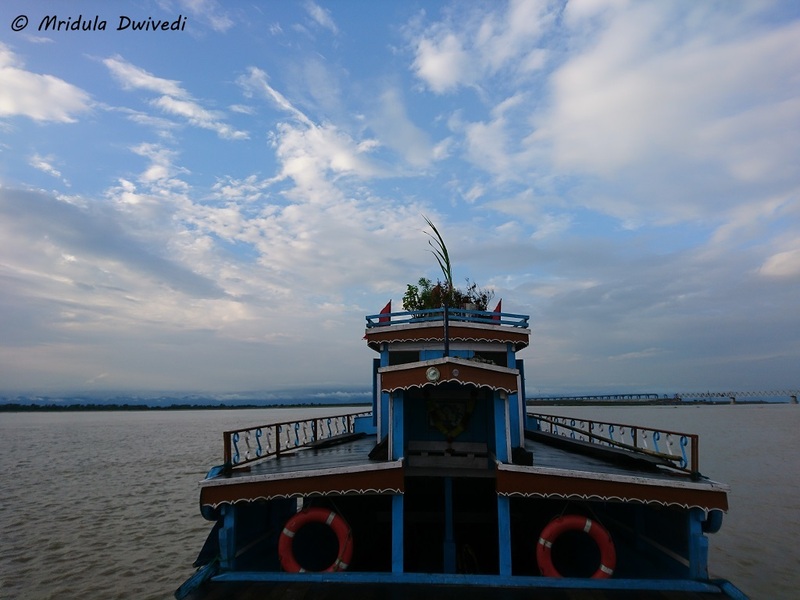 The ferry crossing over the mighty Brahmaputra at Bogibeel could wait, food came first. I ask the young driver where I could grab a quick lunch, adding, I am a vegetarian. 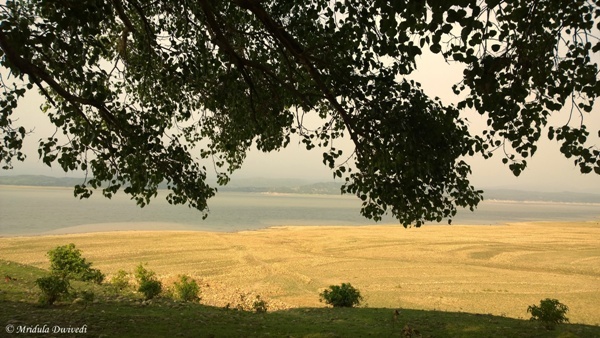 He stopped at Sunfeast Inn not more than 10 minutes away from the Dibrugarh Airport. 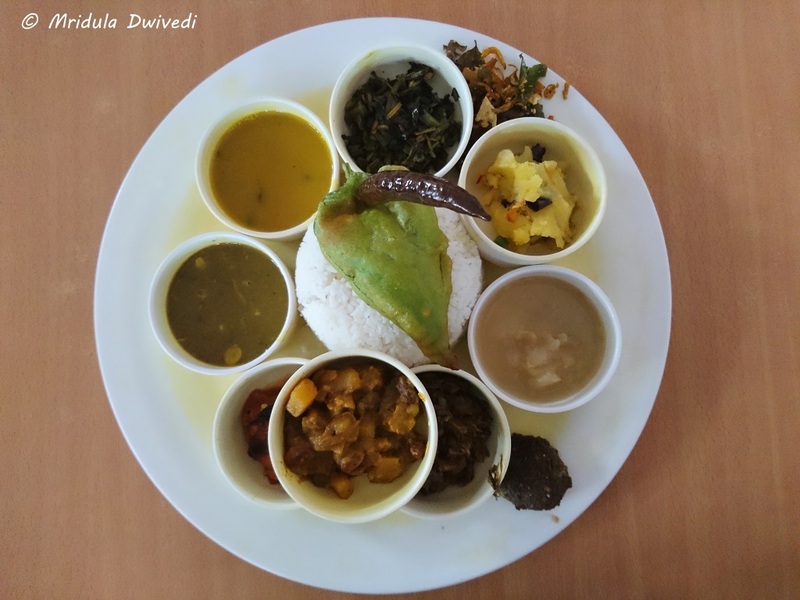 I look at the menu and ask for Assamese Thali! At least it would be different. I am the kind of person who can only tell you whether the food was good or not. Anything more is beyond my capacity. And I have to say the Thali was damn good, all vegetarian too. I paid 100 rupees for the meal, which was what I paid for a pre-mix tea on the flight! My stomach full, I was happy to continue with the journey. 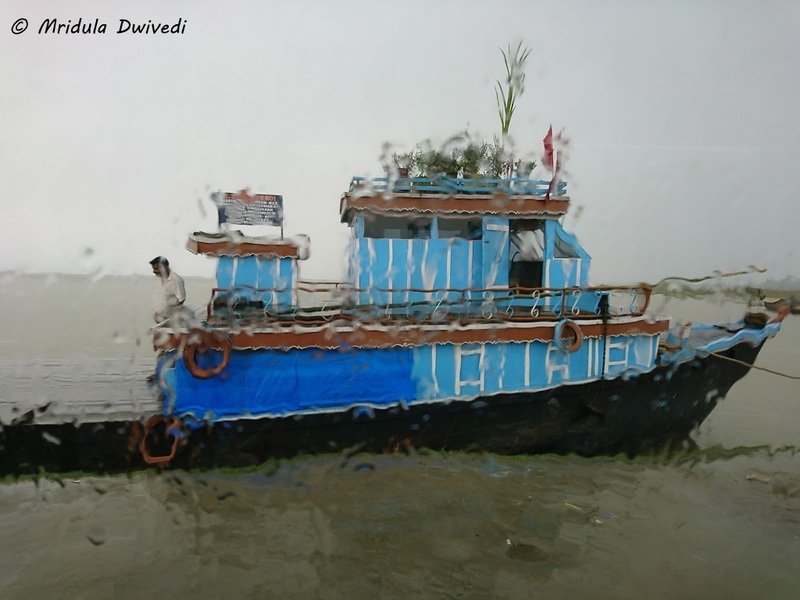 It was Raining at Bogibeel! It started raining on the way. We crossed tea gardens and paddy fields. The driver was new to me, so I resisted the temptation to ask him to stop every few seconds because I wanted to click pictures. The road was decent for a while but soon it turned into what roads are in India, full of potholes. There was actually no road at stretches, only potholes. 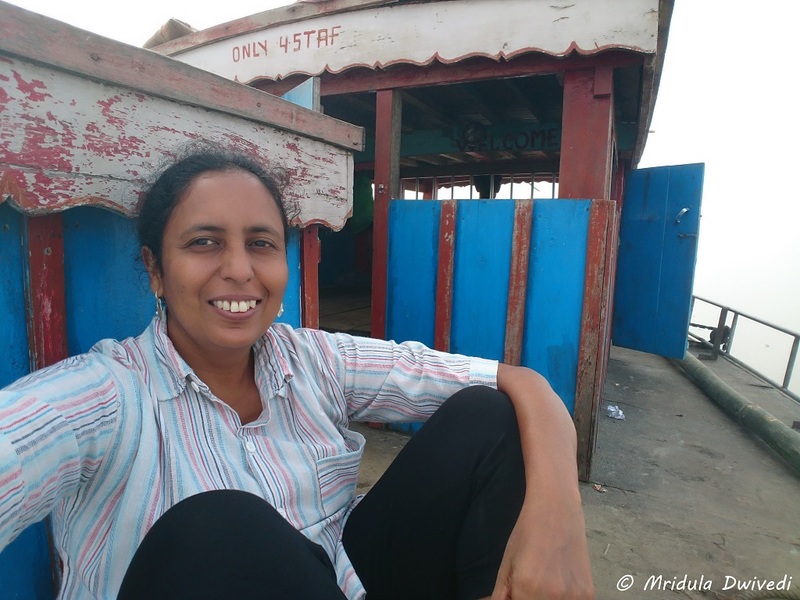 When we arrived at the banks of the Brahmaputra, I was forced to stay inside, it was raining that hard. The driver went out to figure which ferry we were boarding along with the car! It was still raining hard when we got on to the ferry. The driver asked me if I would like to get out of the car. I was out within a second. I ran to a cabin for shelter for it was till raining. The Ferry had Plants too! As the rain lessened and I came out on the deck. I stood quietly soaking in the rain, the mighty river, the tiny ferry with a car on it. The city life and its strife were already fading into nothingness. I knew I would sleep well later in the night, something I had not done for the past few days! There was just one more passenger beside me. We started the small talk. His name is N. Singh, he did not elaborate any further. When I told him I was going to Pasighat he was surprised. He asked why and where was my family. That takes some explaining and I was in no mood to do any explaning. He is from Bihar but has lived in North East for 22 years! I ask him why the bridge is broken, he told me it was not broken, it was not yet complete. There was a Rainbow in the Sky! And then I noticed it, there is a rainbow in the sky, actually a double rainbow! I ran to the car to get out the camera. The car was locked! However the driver noticed me and opened the car. One More Step and I Would be in the River! I forgot conversation, for I tried hard to make the rainbow look good in the pictures too! I hardly came anywhere near it. I take the rainbow as good omen for the trip! 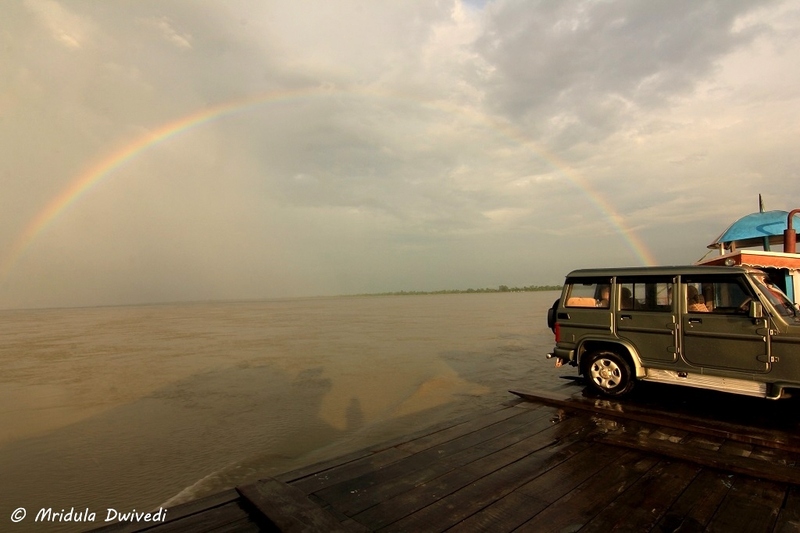 I so wanted the whole car with the rainbow but if I took one step more I would fall in the river! 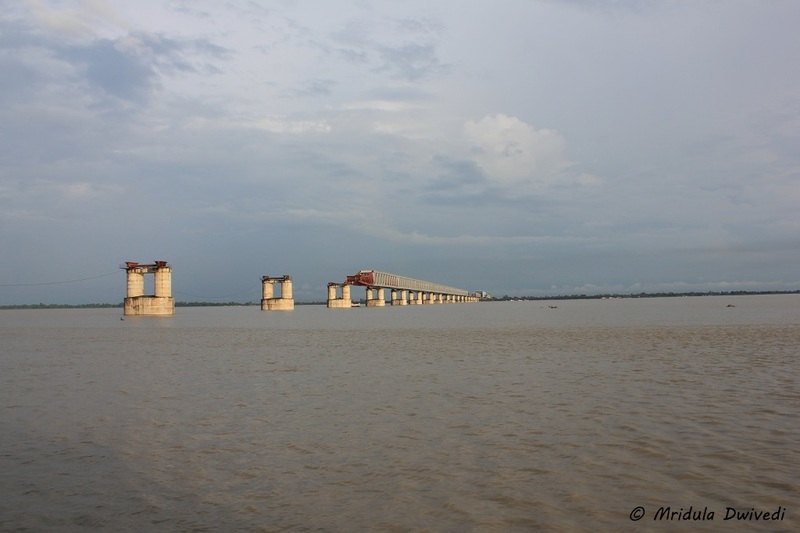 Soon, much too quickly for my liking, I was on the other side of the Brahmaputra at Bogibeel. I was still in Assam. But Mingkeng Osik from Arunachal Pradesh greeted me warmly. I realized I was in safe hands. They told me Pasighat was still 3 hours away. It would be night when we reach! I was not bothered. Mr. N. Singh also joined us in the car, he would get down at the 7 km mark! When we reached the spot, his office staff was there to welcome Mingkeng and me with the traditional scarf! All this when we just met on the ferry boat! There are no star hotels at Pasighat but I already met so many star people in a short span of time, right at the beginning of the journey. 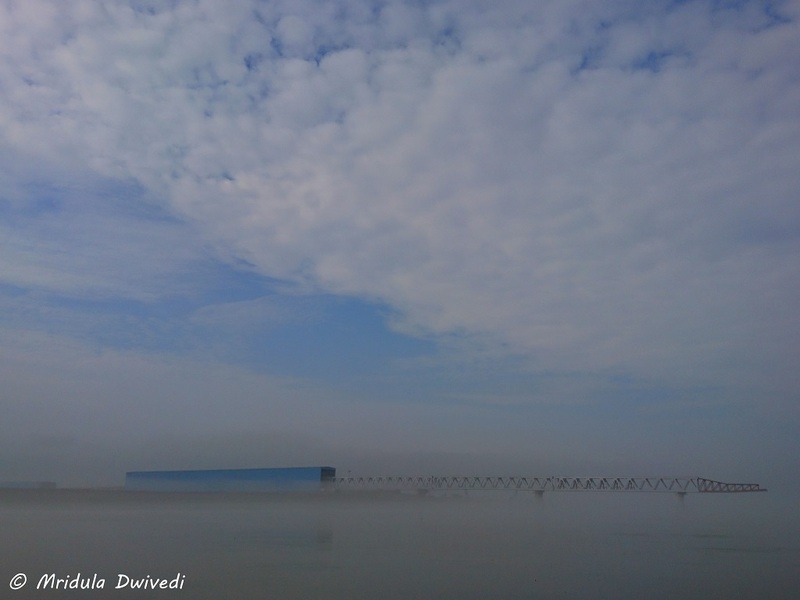 The Mist Over Brahmaputra River! I took the ferry again on my return journey. It was early in the morning. There was mist all around. 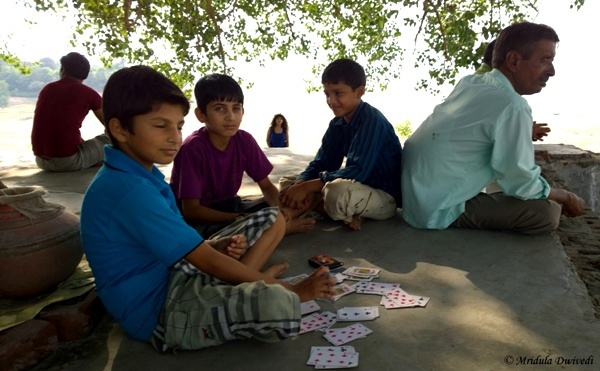 Once again, much too quickly for my liking I found myself at the other side of Bogibeel! Even though I knew what to expect this time, the crossing was as magical as the first time! And this is how cars get on the ferry! PS. I was invited by Nuyee Talong from Arunachal Pradesh Tourism to attend Solung Festival. Last week I did a one night trip to Pragpur in Himachal Pradesh which was on invitation from WelcomeHeritage Judge’s Court. And it was not them who wanted me to stay there for one night. The time constraint was from my side, a fact which I am already regretting. We went sightseeing around Pragpur on both the days, the day I arrived and the next day when we left. It was a hot day when we arrived. While visiting the temples at Chanaur and Dadasiba out cab driver and owner Mr Atul pointed out the Beas river to us as well. Along with Pragpur and Garli both Chanaur and Dadasiba are a delight for people interested in heritage, architecture and paintings. But that is a story for another day. 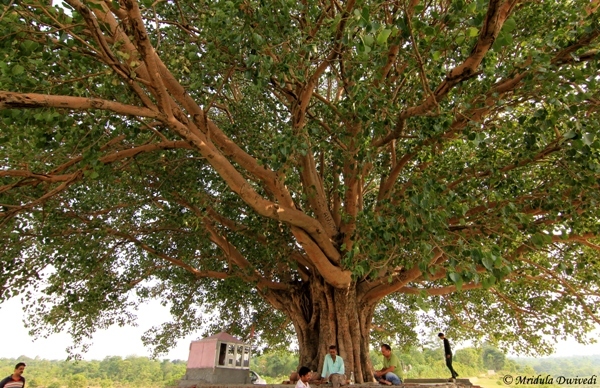 This story is about the giant pipal tree near Dadasiba. After the temple visits Atul stopped at a crossing and asked a villager how could we go closer to the river. He pointed out a narrow road, and there we were, close to the Beas river. The giant Pipal tree was an added bonus for me. I was willing to look at the hot sky only through its cool shade! Try as I might, I could not capture the whole tree in one frame. It had a small chabutra (platform) around it. I too decided to sit in its shade while Pooja (from WelcomeHeritage) decided to take a walk up to the river. Everyone removed their footwear before going on the chabutra and I did the same. One of the menfolks asked me if we were locals? When I said no, he said hardly anyone else comes to this place. They came because it was a hot day and it was cooler under the tree close to the river. I too would have walked by the river but the sun was way too hot. Also at that time of the day I did not see what would I gain photography wise by going close to the river. But in the end it was the sun that the magnificent tree that made me stay put. Guess what? I was very tempted to write ‘sun rays were playing with the pipal leaves’. But was it the sun rays that were playing or was it I who was playing with my camera with aperture set at f22 so that I could capture this effect! 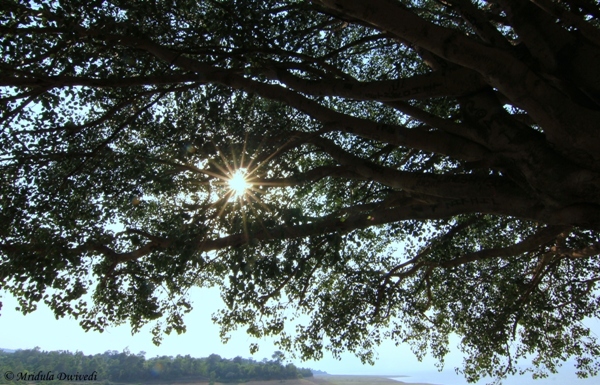 I may have said it at least three times before in this short post by now, but let me say it once more, I was quite awestruck with this majestic pipal tree. The kids were certainly curious about my camera but they were too shy to ask me anything about it. It was only when their elders talked to me that they timidly asked if I would take a picture of them! I was ever happy to oblige! 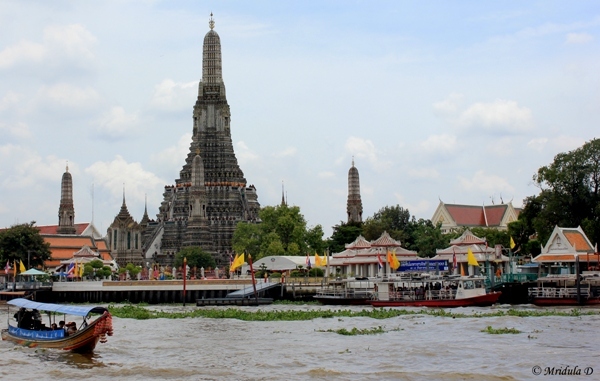 For this lazy Sunday I present the magnificent Wat Arun Temple from Bangkok, Thailand. It is a Buddhist Temple said to be build in 17th century, though the spires are said to be added by King Rama II in early 19th century. Wat actually means temple both in Thailand and Cambodia. Both Thai and Cambodian temples have dress codes. They basically want you to cover your shoulders and knee while entering a place of worship. I thought it was an easy dress code to follow. They are not equally strict at all the temples but they are quite particular about the dress code at Wat Arun. We approached it by the ferry. Chao Phraya river flows through Bangkok and adds so much to the charm of the city. If you take a local ferry from Tha Thien pier it will cost you three baht to reach the temple. The tourist boat would be much more expensive. The temple has steep steps, but once you climb them you can see a beautiful view of Bangkok City. I found going up the stairs easier than coming down. But they did not pose any real trouble to me. I saw others who had their eyes shut and were being escorted down by their friends on those stairs. A small number of vendors are present immediately around the Wat Arun temple. I had the most delicious coconut water ever next to this temple. They put the shell in ice so it is even more delicious. When I visited the temple was not too crowded. I was there in September 2013 and on a week day. If you are interested in photography Wat Arun catches the best light at dawn. Arun actually means sunrise. So that is the best time to photograph at the place. Alas I could not manage to do so on this trip.